We are pleased to be featured in the current (winter/spring 2014) Sierra Season's magazine Gateway's to Yosemite getaways. Located at 3,200 ft elevation we enjoy cool summer evenings and warm summer days. Winter is sunny with occasional snow falls (4-6 per year). We can comfortably accommodate 4 guests. Fully furnished kitchen, stove, oven, microwave, coffee maker, refrigerator with small freezer, pots & pans, dishes and silverware. (Local full service grocery - beer & wine). TV plays DVD's & Wi-Fi, bocce court, patio & lounge chairs, bbq, great back deck, picnic area, fireplace & hearth. toilet, hair dryer & curling iron. Second bathroom located in bunk house has toilet and private best outdoor shower ever! Lots of shade provided by mature trees - hammock available for afternoon nap or curl up with a book. Hiking trails in area, local waterfall and swimming hole. Trout streams nearby - guide service available. Socially and environmentally sustainable adventures in Yosemite available through Echo Adventure Cooperative. Sightseeing, hiking, and fly fishing adventures all include pick up and drop off from Quail Crossing! For more information visit www.echocoop.com. Back deck is fantastic place for a massage - therapist available upon request. Marty loves to landscape and cabin is well appointed with flowering plants and shrubs. Marty and I are San Francisco Bay Area fugitives - living in Half Moon Bay for nearly 30 years. Marty owned and operated a very successful prepatory school and I worked as a manager with AT&T. We have been married for 44 years and love meeting new people. We are fly fishing enthusiasts and I am a guide school graduate (let me know if you want to go fishing!). I earned an MBA from University of Illinois and Marty holds a BA in education with addiitional Post Grad work. We love to cook, entertain, maintain a modest wine closet and host a annual Oktoberfest party. We live on site (our property is 7.5 acres) in our home (completed 2011) and are available to ensure our guests are comfortable and have everything needed to make their stay perfect! We love the location of our property in the peaceful, scenic Wagner Valley. We have lots of tall pines and oak trees. Mariposa county boasts 356 days of sunshine annually. Local waterfalls, hiking trails and abundant wildlife (wild turkeys, bobcats, bears, coyotes and deer) make for our eco-system interesting. We want to make your stay a highlight! Yosemite is a magical place and all who go there fall in love with the majesty of the Valley - El Capiton, Half Dome, Bridal Veil Falls and Yosemite Falls - each one a marvel. Our property is located in the Wagner Valley, a two mile long valley home of a Llama ranch and open space. Our property in on the southern slope of the valley and forested with mature pines and oak trees. Bright stars fill the night sky and we often hear the lonely call of coyotes or local owls high in the trees. The cabin has generator back-up power supply should a power outage occur. You must make prior arrangements if arriving after 9pm. Steve & Marty were fantastic hosts and the place is spotless. So lovely in every way. Unbelievable amount of widelife. Saw 6 deer in 3 days and over 40 turkeys. One night there were 27 about 40 yards away. My last night there, they all came back and one jumped on the picnic table. They must love it there as much as Steve and Marty's guests. Thank you again and I will be back for sure!!! We love sharing our cabin and love hearing about our guests Yosemite experiences! Thank you for being a great guest - we do hope you'll return again.....fall and even winter are especially wonderful times in the park. What a great getaway we had. I took my family of 5 to the cabin and we all loved it. The peaceful location, wildlife, and the whistling trees made for a wonderful weekend. We played games, went for walks, BBQ, and enjoyed hanging out by the fire pit. Great time to catch up with each of us. On top of all of that, not far the the national park entrance to Yosemite. We have marked this as a "must stay" the next time we head back to Yosemite. Marty and Steve , were the perfect hosts. Their cabin is a woodland paradise. The cabin is warm and inviting, and has lots of windows that let in plenty of light. Simply put the cabin was exactly what we were looking for during our woodsy vacation. As a bonus Steve was kind enough to setup an outdoor fire for us! I would highly recommend staying here if you get the chance, you won't regret it! P.S. Enjoying wine in front of the fireplace can't be beat . This cabin and the hosts are more spectacular than we could have ever imagined. With welcome cookies and a bottle of wine, Steve and Marty greeted us. The cabin is clean, comfortable, fully outfitted with everything you need and more. We enjoyed the outdoor shower, cooking dinner, relaxing after long days hiking in Yosemite and playing some bocce. This cabin is a special place. 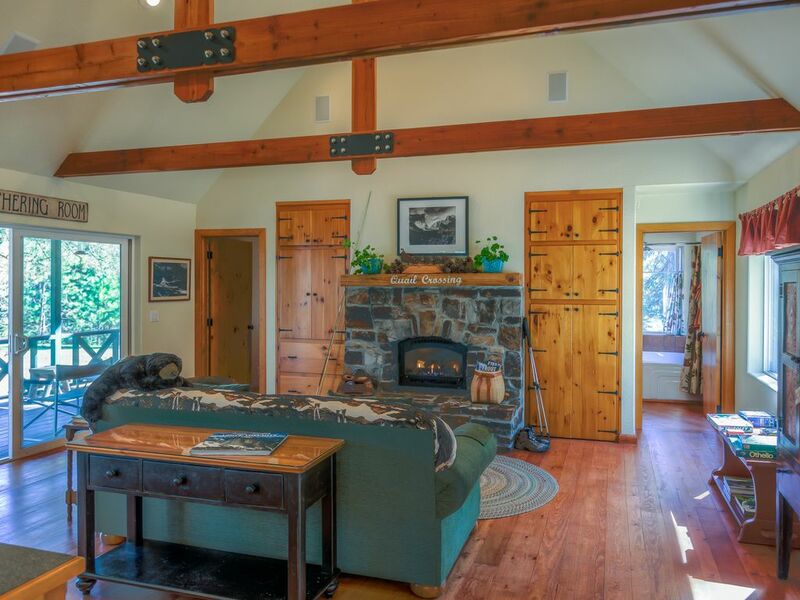 Steve and Marty's Cabin at Quail Crossing is an idyllic property. In addition to a gorgeous main cabin, with a large living, dining, kitchen area and bathroom, is a separate bunk house, with its own outdoor shower, that is ideal for housing teenagers anxious to escape mom and dad after a day at Yosemite. Close enough to be in Yosemite in 30 minutes but far enough away to escape the summertime crowds, the feeling is one of getting away to your own place in the corner of the woods (or at least a place that many of us dream of having). The entire experience could not have be more perfect. Steve and Marty were excellent hosts and we regretted not having enough time to get to know both of them better. Their attention to detail in the accommodations was evident everywhere and told us that their guests’ comfort and enjoyment is their prime concern. We cannot overstate our happiness at having found this gem tucked away in the California woods. Thank you both for a wonderful, too-short, three days at Quail Crossing. thank you for the great review...we loved having your family here and glad your Yosemite experience was fantastic! We really love sharing our property with families and have had some very interesting and incredible guests - you included! Best wishes to you and your family & thank you for staying with us at Quail Crossing. Yosemite is the must see/do of your region but there are many other activities to enjoy; river rafting or scouting for unique antiques, go gold panning like the 49'ers, hiking, trail bikes, spring wild flowers are a secret gem, fishing, golfing, bocce, and so much more. Use of the bunk house is an additional $25 per night and a one time $30 cleaning fee. The bunk house sleeps two - two twin beds and a bathroom. This unit may not be available during winter months.